PALM SUNDAY OF THE PASSION OF THE LORD The blessing of palms will take place at all Masses this weekend. WEDNESDAY IN HOLY WEEK The Chrism Mass will take place in Brentwood Cathedral at 19.00. Most priests of the Diocese will be attending because this is when we solemnly observe Our Blessed Lord's institution of the priesthood. At the Chrism Mass Bishop Alan will bless the Oil of Chrism which will be distributed to all parishes for use during baptism and confirmation and for anointing. MAUNDY THURSDAY- MASS OF THE LORD'S SUPPER at 20.00. At this Mass we recall the institution of the Eucharist at the Last Supper and the institution of the priesthood. This is a joyful Mass where Christ gives Himself to us for all eternity. During the celebration there will be the Washing of Feet and solemn procession of the Blessed Sacrament to the Altar of Repose. There will be a watch until midnight and we are all encouraged to spend some time with Christ in the Blessed Sacrament. GOOD FRIDAY-THE SOLEMN LITURGY at 15.00. Today we will mourn the death of Our Lord and Saviour Jesus Christ. The sacraments are not celebrated on this day. There will be the Liturgy of the Word and the Veneration of the Cross followed by Holy Communion from the reserved Sacrament. We recall that Christ submitted to death humbly to redeem us all. HOLY SATURDAY The church waits in quiet stillness whilst Our Lord rests in the tomb. No Mass is offered on Saturday morning. THE VIGIL AND FIRST MASS OF EASTER at 20.00. 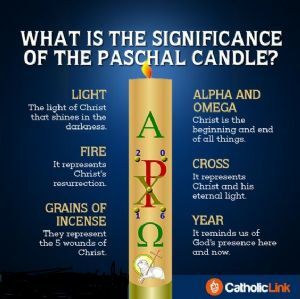 1.The Service of Light where we light new fire and the paschal candle to symbolise the light of Christ. 2. The Liturgy of the Word where we trace salvation history through scripture culminating in the Easter Gospel. 3. The Liturgy of Baptism where we bless the waters of baptism invoking the aid of the saints for the remission of sins and our incorporation into the death and resurrection of Jesus . 4. The Liturgy of the Eucharist where we join together around Christ's altar where He makes Himself truly present. This is the source and summit of the Christian life.